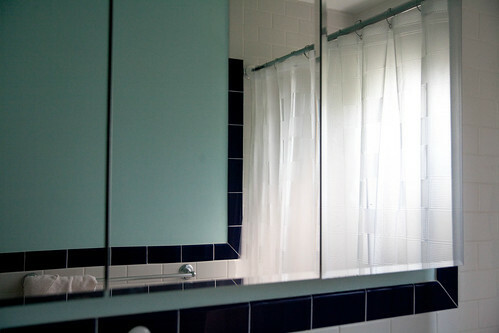 DIY Del Ray checked out a local bathroom renovation. The owners updated their bathroom to make it more their style. The design was somewhat dated, with, as they put it, boring tile, bead board that never looked clean, and scarcity of storage space. We don’t have a decent design gene between us. We were waiting to get inspired, to see something we would like. We knew what practical things we wanted like the kind of faucet and shelf on the shower wall, and more storage space inside the bathroom. We wanted a vanity with all mirrors, plus mirrors inside to let me cut my own hair. 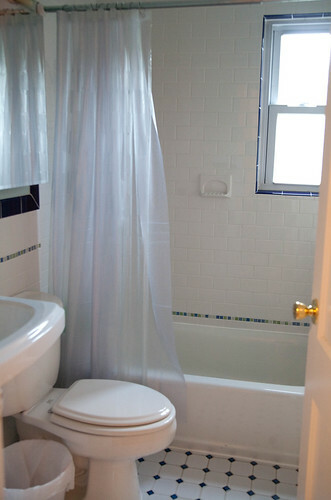 We also thought the color theme was okay (white and light blue), and we liked the white porcelain for the toilet, sink, and bathtub, although we only ended up keeping the toilet. We love the subway tiles. 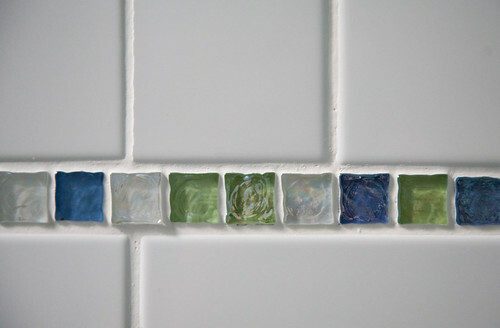 We like the creativity in the way we used a different color blue glass as an accent. We splurged and got two sets because we found one we liked better than the first one. We also really like the huge medicine cabinet. We were really excited when we found it. It’s three times as big as the old one, but it makes the whole room seem bigger because it’s mirrored. The whole space is more functional and looks better. 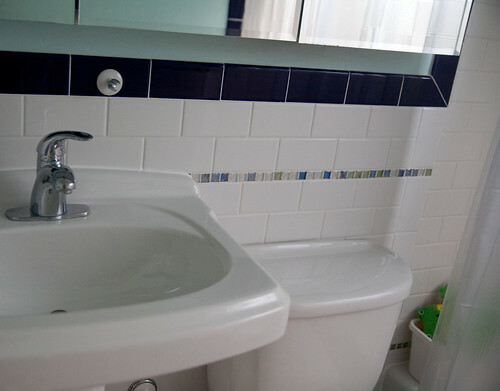 The small glass tiles along with the cobalt blue tiles and floor tiles make it feel more spacious. 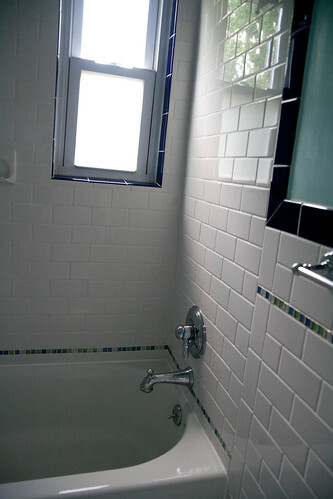 The tile on the inside of the window was a great call. We had the contractor make the window at a slight incline. You don’t notice, but makes it less wet on the edge and the caulking stays more dry. It’s a small thing, and we never had a mold issue before, but I feel like it was a smart move. We weren’t sure what to do about the window. Should we put tile inside? We asked friends and a friend’s mom, an interior decorator, suggested putting the tile inside. We love how it looks. I wish I put more space-saving things in like hooks because I have a child now and we need to store more stuff. I’d also find a sink with a cabinet or drawer underneath instead of the pedestal sink, which at the time, I thought would be a space saver, but wasn’t as it turns out. Our townhouse community was built in the 1950s as practical, very solid housing. 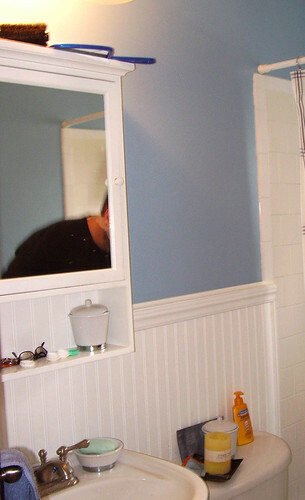 When you redo one of these homes, it’s hard to get to the back of the walls. You’re faced with concrete, reinforced mesh, and rebar. Getting the bathtub in was especially difficult. Get a good recommendation for contractor. Shop around. Go to bathroom showroom to get ideas. The home expo was helpful too. Find a picture to use as inspiration. If you have a question about this project for the homeowners, use the comment field below. Want to share your before and after story? Email diydelray[at]yahoo.com. That is really lovely! Practical, simple, AND aesthetically pleasing. I may steal these ideas when we put a 3/4 bath in our basement. I’d love to get an idea of a sample budget for this renovation. It looks great and I think most of our Del Ray townhouses have a layout very similar to the one shown in the photographs. Thanks for this post!